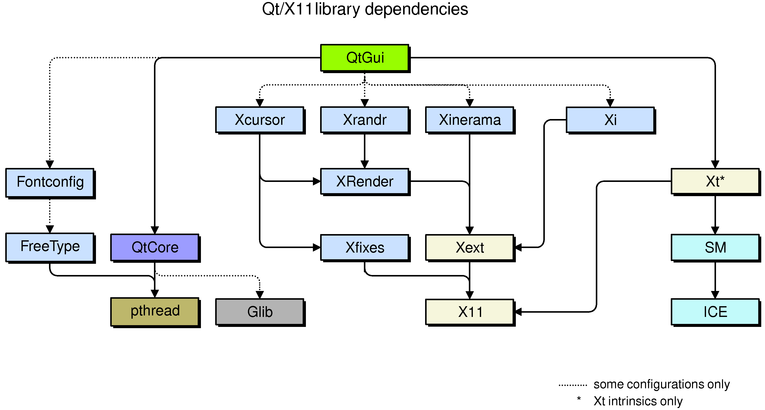 The QtGui module and the QtCore module, which provides the non-GUI features required by QtGui, depend on the libraries described in the following table. To build Qt from its source code, you will also need to install the development packages for these libraries for your system. Note: You must compile with XRender support to get alpha transparency support for pixmaps and images. The configure script will autodetect if OpenGL headers and libraries are installed on your system, and if so, it will include the QtOpenGL module in the Qt library. If your OpenGL headers or libraries are placed in a non-standard directory, you may need to change the QMAKE_INCDIR_OPENGL and/or QMAKE_LIBDIR_OPENGL in the config file for your system. As described in the Phonon Overview, Phonon uses the GStreamer multimedia framework as the backend for audio and video playback on X11. The minimum required version of GStreamer is 0.10. To build Phonon, you need the GStreamer library, base plugins, and development files for your system. The package names for GStreamer vary between Linux distributions; try searching for gstreamer or libgstreamer in your distribution's package repository to find suitable packages.